16xSFP+ 10-Gig ports,1x480GB SSD internal storage, and DC power supply. 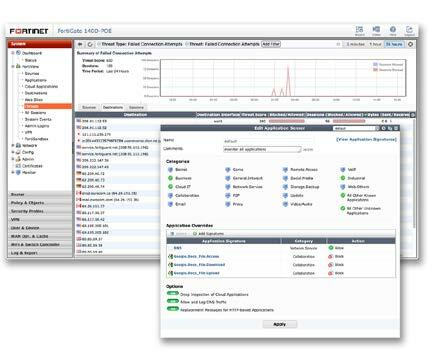 The FortiGate 3000D appliance provides up to 80 Gbps of firewall throughput through the use of innovative FortiASIC processors and the latest generation of multi-core CPUs. Impressive consolidated security performance and support for a variety of configurations ensure that essential security functions keep up with the rest of your network. The system also provides technologies that include robust networking capabilities and extensible security features, all managed from an intuitive management console with deep insight offerings, enabling you to keep pace with your evolving network. High speed connectivity is essential for network security segmentation at the core of data networks. The FortiGate 3000D provides the highest 10 GE port densities in the market, simplifying network designs without relying on additional devices to bridge desired connectivity. Download the Fortinet FortiGate 3000D Series Datasheet (PDF).